Singapore’s Changi Airport has long been touted as the “best airport in the world.” That status becomes even more cemented on April 17, when it will officially open a dazzling presecurity attraction known as Jewel. Inside is a lush four-story tiered garden, more than 280 retail and dining outlets, a hotel, a multi-screen IMAX theater and its centerpiece: a 130-foot-tall Rain Vortex, which is the world’s tallest indoor waterfall. 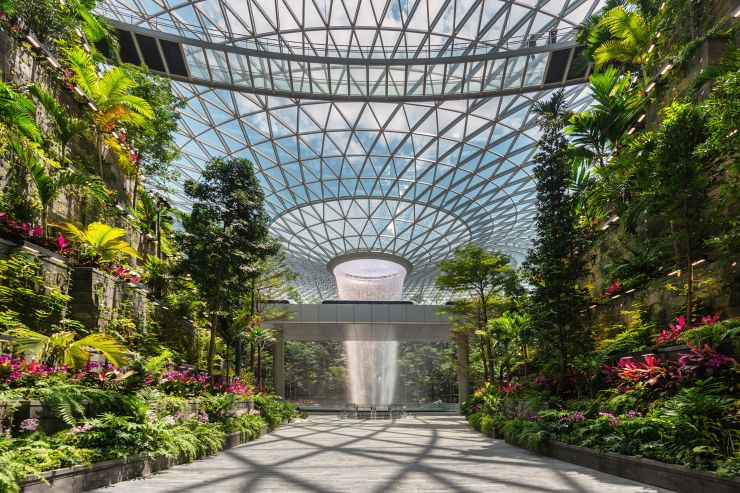 The next phase of the project rolls out in June, when Jewel Changi Airport opens a bundle of added features (many ticketed) to the public, including a 164-foot-long glass-bottomed bridge, nets for bouncing and walking, mazes, topiary sculptures and more. Housed inside a toroidal, or doughnut-shaped, glass and steel structure designed by noted architect Moshe Safdie, Jewel Changi Airport is adjacent to Terminal 1 and sits on airport real estate that was formerly a parking lot. The striking new structure now covers more than 1.46 million square feet. It has 10 stories — five above ground and five below — and was built on budget, at a cost of $1.7 billion Singapore dollars (US$1.25 billion). When I first flew into Singapore, Changi did not exist. Aircraft landed at Paya Lebar which is now a military airport I believe. Obviously there was not much vehicular or indeed aircraft traffic at the east end of the island because whenever an aircraft had to taxi, part of a roadway had to be temporary closed. Even Concorde regularly landed there when it was operated jointly by British Airways and Singapore Airlines. Changi was conceived in the mid-1970s. It required a massive new landfill for it sits totally on reclaimed land and the construction of new access roads in addition to the airports first terminal. Lee Kwan Yew had a vision of Singapore as a major air hub at a time when the number of tourists flying to Asia was infinitesimal compared to today. The only guaranteed passengers would be those on the kangaroo route to and from Australia and those on flights already using Paya Lebar. I do not think any other Asian leader at the time would have had either the vision, determination and ability to obtain finance for what many must have viewed as a hugely risky project. Creating the worlds best airport serviced by arguably the worlds best airline remains an extraordinary achievement.